One of the great things about Apple as a company is that you can never really be sure of what they are going to do or try next in their pursuit for excellence across their extremely popular consumer technology product ranges. Apple is one the only few companies across the world who have the financial might and status to be able to lazily play around with ideas and hobby projects that may not term into long-term products or even make it to the market place. As we eagerly await any announcement about what they have in store for us with the sixth-generation iPhone, it seems pretty nailed on that their next smartphone release will be an extremely popular combination of hardware and software, continuing to bow sales records away when it is released. As is always the case with Apple, it seems like they have their eyes firmly fixed on developments further down the line and aren’t single-mindedly applying all resources to their next product launch. Their latest patent filing with the United States Patent and Trademark Office would seem to indicate that they are mulling over applying additional focus to how users can enhance their photographic experiences when using an iPhone. 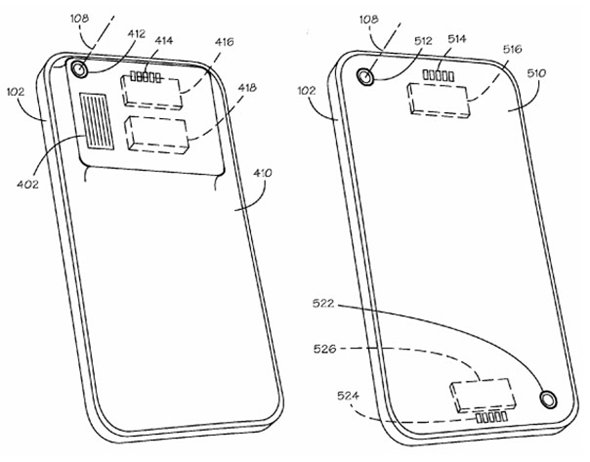 Patent number 20120147193, dated yesterday with the USPTO lists the inventor as Richard Tai on behalf of Apple Inc. and is described as a "back panel for a portable electronic device with different camera lens options". Long story short, it points to Apple making plans to offer consumers the option of changing the glass back panel on their device in order to benefit from different camera lens types. I think pretty much everyone who takes interest in Apple keynotes and product launches is aware at just how popular not only the iPhone is, but also how popular the camera system is that comes with devices like the iPhone 4 and 4S. Displayed statistics during the presentations have showed that the iPhone 4 was the most used device to take photographs and uploading images to the Flickr network, testament to just how widely used it is. At the moment is isn’t really clear how Apple intends to utilize this latest patent, or if they indeed will make use of it at all, after all they could be storing this for future products/plans. It is however possible that a future iPhone could allow users to remove the back panel and replace it with an Apple-manufactured or third-party replacements.